Let’s start with the menu. When I found out that “umami” in Japanese literally means “pleasant savory taste”, I was sure I came to the right place, the place where somebody cares about my senses and/or feelings. And it just feels good to know that. The things that will awaken and exhilarate your senses for sure are aromas and tastes of the various dishes that could be described as Asian fusion cuisine. From Origami soup to a delicious falafel salad, it is a stroll through Asian specialties ranging from Kn 16 – Kn 39 served in a very small but cozy space, while in summer months the food is served at the restaurant’s terrace, in the middle of Skalinska street. Be prepared for more heavy spiced tastes but they’re all nicely balanced. Umami is the place where meals like falafel, curry, pad thai, yakitori are prepared as they should. From approximately 10 dishes on the menu my favorite one is Samurai wok – noodles with beef and vegetables. If I needed one more extra reason to love Friday, I do not need it anymore – check this out! On Fridays, Umami will make you happy with these atypical hamburgers so called “BUNS“. It is a combination of grilled chicken, with thin layer of crispy chicken skin, a little bit of cabbage and all that packed in delicious soft buns (original Umami recipe) with salt sauce. 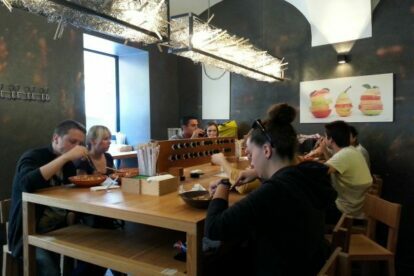 Great thing is, there is now more space to enjoy perfect umami food.